A few weeks ago, when free agency began in the NHL, and players began signing with their new teams, it was a great time for autograph collectors, as many memorabilia companies were discounting items of players on their now-former teams. I actually managed to get a signed photo that actually fits the criteria of both a current and former team from Your Sports Memorabilia Store, with this Brandon Saad 8x10 of him raising the Stanley Cup. 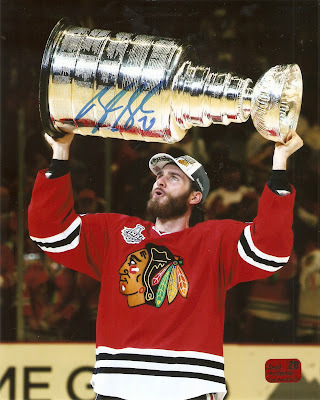 He won two Cups in Chicago (2013 & 2015) before being traded to the Columbus Blue Jackets The summer following his second Stanley cup win. Two years later, they shipped him back to Chicago in a deal that brought 2016 Calder Trophy winner Artemi Panarin to Columbus. This photo is perfect, as it is a great addition to my Stanley Cup photo collection, and it once again shows him on his current team. 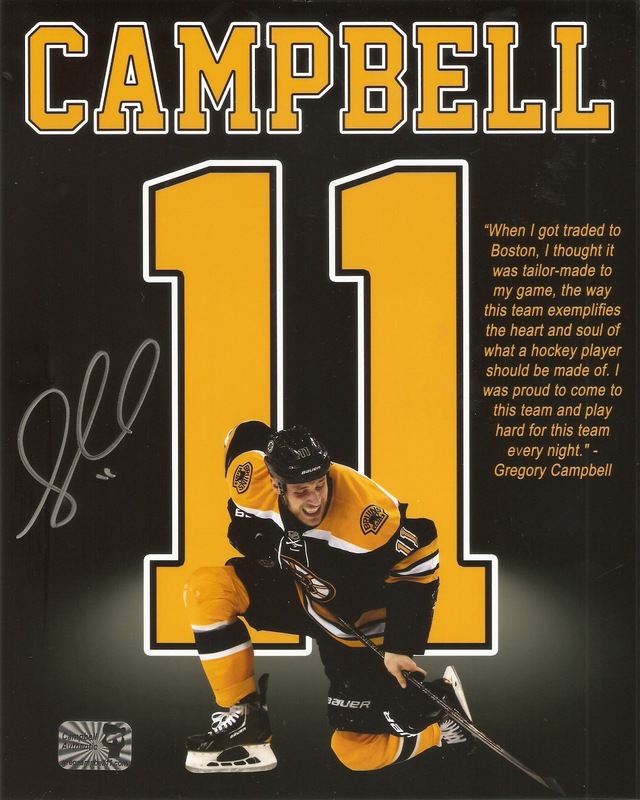 I was also able to get my hands on an item I had been wanting for a long time, with this signed 8x10 of former Boston Bruin Gregory Campbell. While he did put in a few years in the NHL, he is fondly remembered for one moment in particular, when he finished his shift during the 2013 Stanley Cup Finals after an Evgeni Malkin slapshot broke his leg. 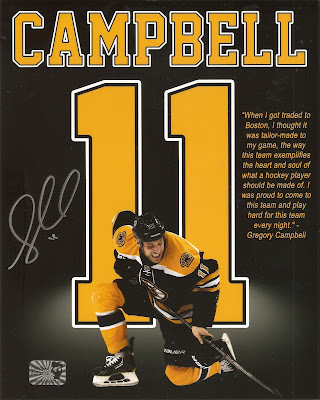 The Bruins were on the penalty kill, and Campbell ended up skating on his broken leg for over a minute, successfully killing the penalty before he was able to make it to the bench. He was never a big-name player, but to me, that moment epitomizes the toughness and dedication of a hockey player. This photo is of the moment when he is picking himself up off the ice right after blocking Malkin's shot, and is the perfect image to capture this moment.